Scooper - Technology News: China has announced its Five-Year Plan, but what does it mean for the future? China has announced its Five-Year Plan, but what does it mean for the future? I recently returned from Beijing, where I had spent a week talking with Chinese officials and attending the China Development Forum (CDF), the major annual gathering of Chinese and senior foreign officials and top business executives. The Chinese government had just released its 13th Five-Year Plan, and officials were eager to explain what it means for China’s future. Although the latest plan contains a seemingly endless list of specific projects and goals, the major new theme this year is “supply-side restructuring,” a term that includes a wide range of policies aimed at boosting economic growth and living standards. The term “supply side” is intended to distinguish these new policies from the traditional demand-side measures of easy money and a slightly larger fiscal deficit that are already aimed at strengthening economic activity. High on the list of supply-side policies is eliminating some of the excess capacity of state-owned firms in the steel and coal industries. This means shedding some four million workers, a number equal to about 0.5% of China’s workforce. The plan authorizes a special fund to provide assistance to those who remain unemployed. Experts believe that much more downsizing is needed; but the authorities are starting small to see how it works and to monitor the public’s response. China will also be shifting millions of people from low-productivity agricultural areas to dozens of new cities, accompanied by ambitious plans to build 50 new airports and thousands of miles of new roads and railroads. The authorities also tout the One Belt, One Road project, which will use Chinese financial assistance and resources to develop ports, railroads, and highways linking China with other parts of Asia, central Asia, and potentially even Europe. The foreign-policy goal is to expand Chinese influence in the region and beyond. It will also provide an opportunity to export some of China’s excess industrial capacity. Moreover, officials intend to stimulate innovation through research and development, including by lowering tax rates for high-technology firms. Tax reform will also extend China’s value-added tax to the service sector. And financial reforms will eliminate the limits on interest rates that banks can pay on deposits and charge on loans. At the same time, there is substantial confusion about China’s new foreign-exchange regime. In recent years, the renminbi’s decline relative to the dollar has prompted complaints from American firms that compete with Chinese products. But the renminbi has also strengthened by 25% relative to other advanced-country currencies since 2010. The authorities promise to allow the market to determine the exchange rate, and that there is no reason for a sustained decline. But officials continue to report the renminbi’s movements relative to the dollar because they fear that emphasizing exchange-rate management relative to a currency basket will suggest further decline relative to the dollar, an expectation that would increase capital outflows. Policies to improve the environment are also high on the government’s agenda for the next five years. The public is eager for cleaner air, rivers, and land. To achieve this, the government will adopt new regulations and create “green bonds” to finance remediation and low-carbon energy sources. Chinese auto firms are being encouraged to produce hybrid cars, and the government is warning foreign auto companies that it will take steps to reduce their market share if they don’t conform. Improving the quality of life also requires boosting the quality of products that Chinese consumers can buy. One government minister at the CDF noted that the one million Chinese tourists who went abroad last year used their credit cards to buy about $1 billion worth of goods that they cannot obtain at home (while noting the irony that some of those European and American branded goods are actually manufactured in China). China is still a low-income country, with per capita GDP of just $14,000, about one fourth of that in the United States. Although Beijing and Shanghai are relatively prosperous, there is still much poverty. It is revealing that to achieve the Five-Year Plan’s goal of eliminating poverty by 2020, which requires reducing the number of poor people by 55 million, the poverty line is defined as just $354 a year, or less than one dollar a day. Chinese corporations’ high level of debt could be a source of financial instability, although several officials stressed that they were not worried. Government data show that the ratio of bank loans to GDP is about twice that of the United States. More worrying, the share of nonperforming loans may be dangerously high. But even if that share is higher than official statistics indicate, China’s bad-debt problem is very different from that of the West. China’s largest corporate debtors are state-owned firms, and their creditors are state-owned banks. So resolving the bad debts would involve transferring the losses from the state-owned banks to the government. And, because the government debt is relatively low – about 17% of GDP – it would not be difficult for the government to absorb these losses. If necessary, it could also deal with the excess debts that local governments, encouraged by the central authorities, incurred in 2008 and 2009. What was not discussed at the CDF is the major crackdown on high-level corruption that President Xi Jinping is pursuing and that many say is impeding economic decision-making and slowing GDP growth. Nor was there any discussion of the widespread concern about an ideological shift to the left that could threaten property rights, leading to capital flight as individuals seek to protect their wealth. 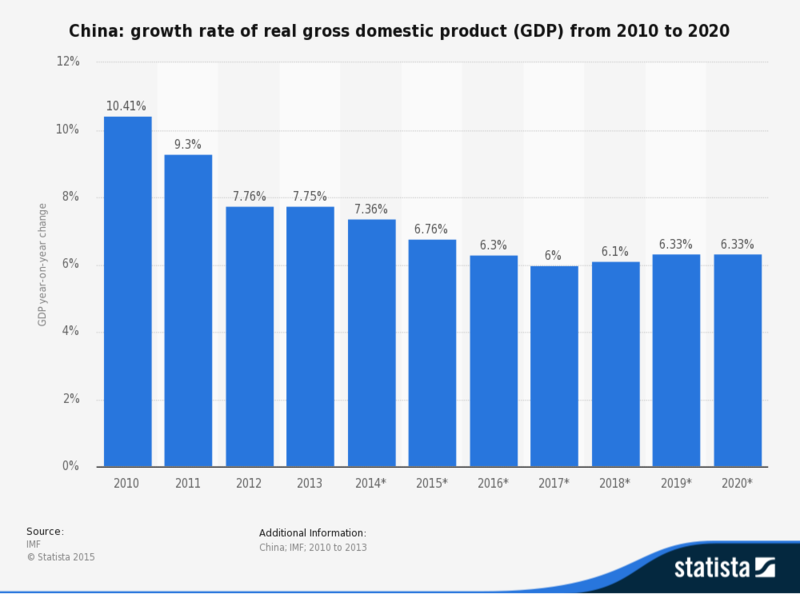 But while China remains a complicated puzzle , the authorities are clearly pursuing pro-market reforms designed to produce real annual growth of 6.5% or more during the next five years, leading to the doubling of real per capita income by 2020 that the Chinese Communist Party called for in 2010. If that target is missed, it will not be for a lack of effort on the part of the Chinese government.